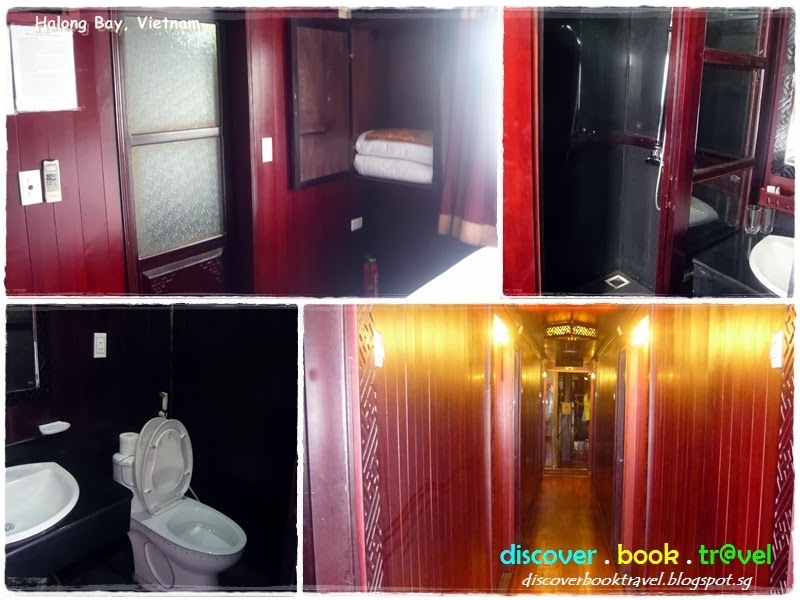 This post is part of our Hanoi 7 days 6 nights Trip Itinerary and Report. 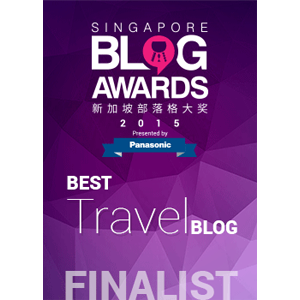 Do check out the full itinerary and our reviews here. Halong Bay is said to be the most popular tourist attraction in Hanoi, Vietnam and is the top to-do activity in Hanoi. Listed as a UNESCO World Heritage site, the bay features thousands of limestone karsts and islands, carved by nature into various shapes and sizes. Because of its climate and environment, Halong Bay is also home to a large biodiversity of floral and fauna species. The perfect way to discover this world natural wonder is to embark on a traditional junk ship that brings you deeper into Halong Bay and its surroundings. There are 2 popular cruises – a day tour for visitors who only want to have a glimpse of Halong Bay and its surroundings (usually takes about 4 to 6 hrs); and overnight cruises for those who have more time to spare and would like to venture further to explore caves, grettos, floating farms and do some kayaking. 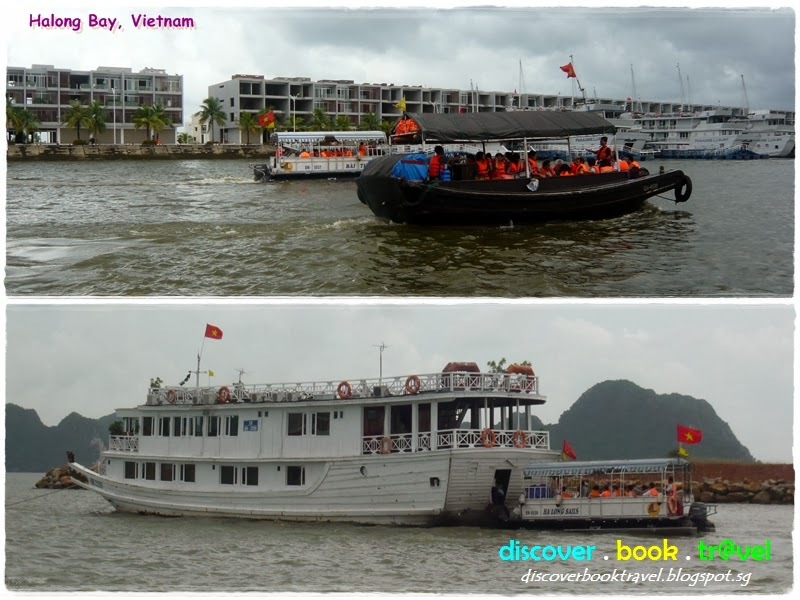 Tip: If you are basing yourself in Hanoi city, we recommend a overnight cruise (either 1 night or 2 nights) over a day cruise, as the travelling time from Hanoi city to Halong Bay is already 3-4 hrs one way. 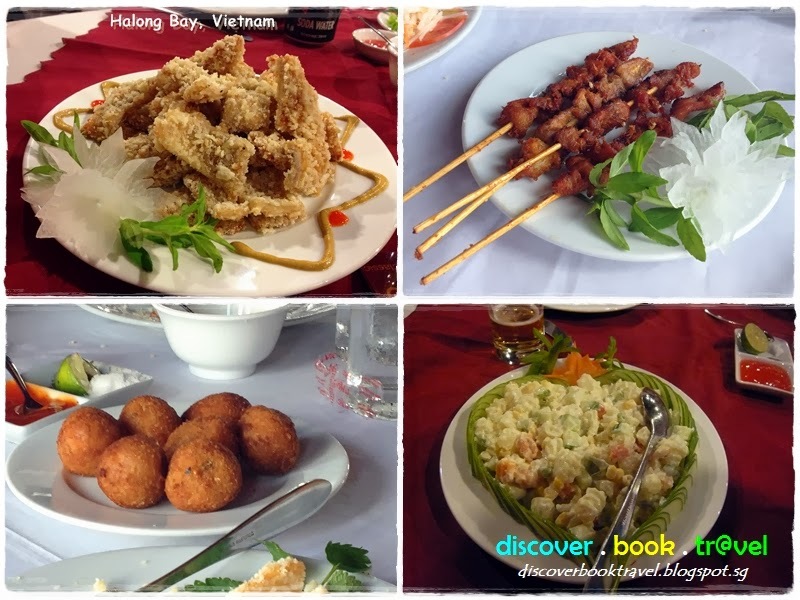 Booking a Halong Bay cruise is relatively easy. 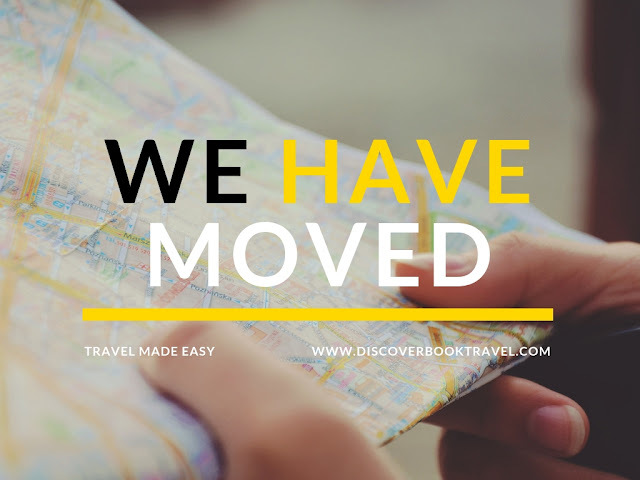 You can do so either directly from the cruise line via the internet, from a Hanoi based travel agent, or from your Hanoi hotel. 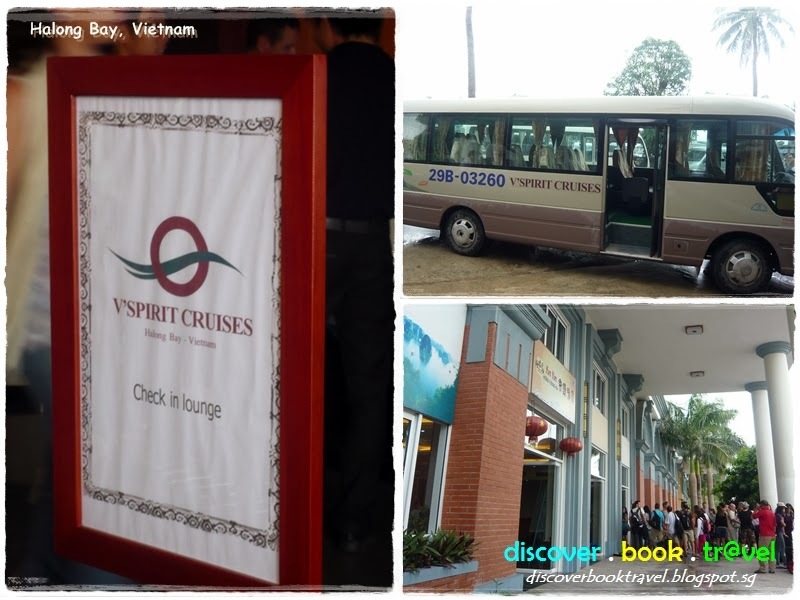 For instance, our 3 day 2 night cruise on board the V’Spirit was booked through our hotel Splendid Star Suite Hotel. It takes 3-4 hours to reach the harbour from your hotel at Hanoi City, with one short break in between. Time to stretch those tired legs and wait for our turn to get on V’Spirit. The junk ships are considered too large to enter the harbour, so passengers were all transported to the ship via small boats. Our home for 3 days and 2 nights, this cabin sure looks its age. Yet, we still love the spacious bed and the side windows that overlook the bay. Tip: If you can, try to request a room that is not directly under the dining room. The floorboards above are not that sturdy and we could hear every footstep above us even in the wee hours of the night. All meals on board (breakfast, lunch and dinner) for the entire duration of our cruise were covered under the cruise package, with the exception of beverages. Some cruise lines have different menus – some focusing on more Western cuisine or buffet style dining. At V’Spirit, the meals were all family style – large tables with 6-8 seats. Couples and small groups would have to join fellow cruise mates for all meals, something that some of us were not comfortable with. 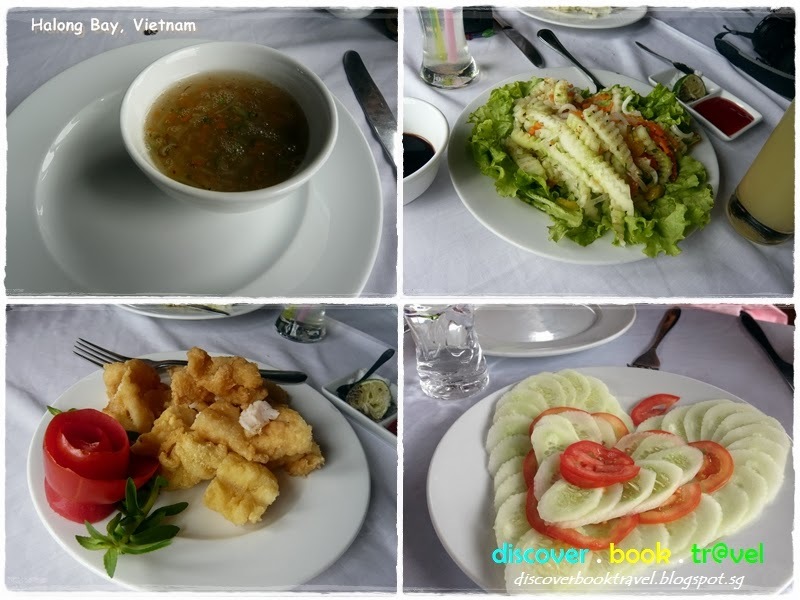 Nevertheless, the meals served were all delightful and we must say was one of the plus points of cruising with V’Spirit. Welcome drinks served to us every time we re-board the junk ship. Beers are ridiculously cheap in Hanoi, even on a cruise! By comparison, fruit juices and mocktails cost so much more! A pity that we do not take alcohol, we had to settle for an expensive mocktail (USD $4 each). One of those things that we look forward to every day is meal time. And why not, given the very delectable things they whip up in the confines of the junk ship. At V’Spirit, their home-cooked style cuisine is especially tasty and memorable and I still miss it to this day. 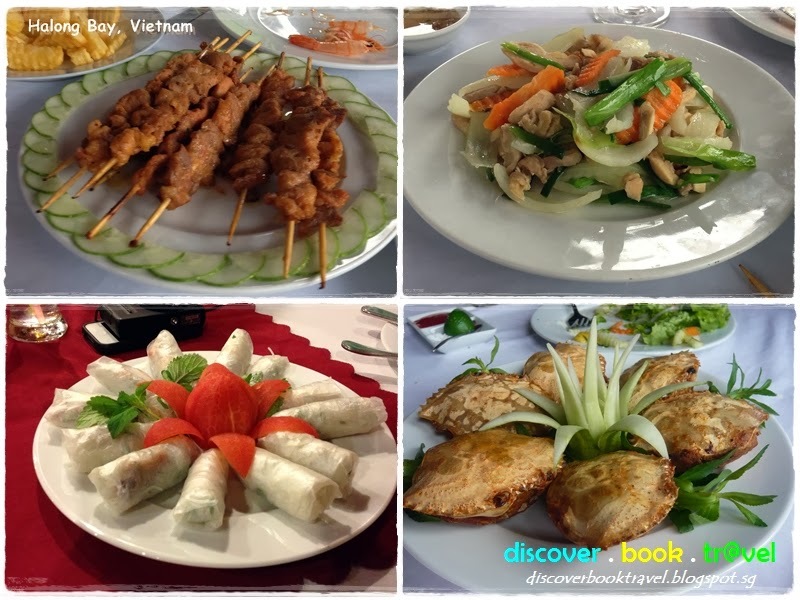 Although most dishes are Asian or Vietnamese style, there’s also a fair amount of Western dishes at each meal. Warning: Do not venture to the kitchen area. You might not want to eat after seeing the food preparation area. 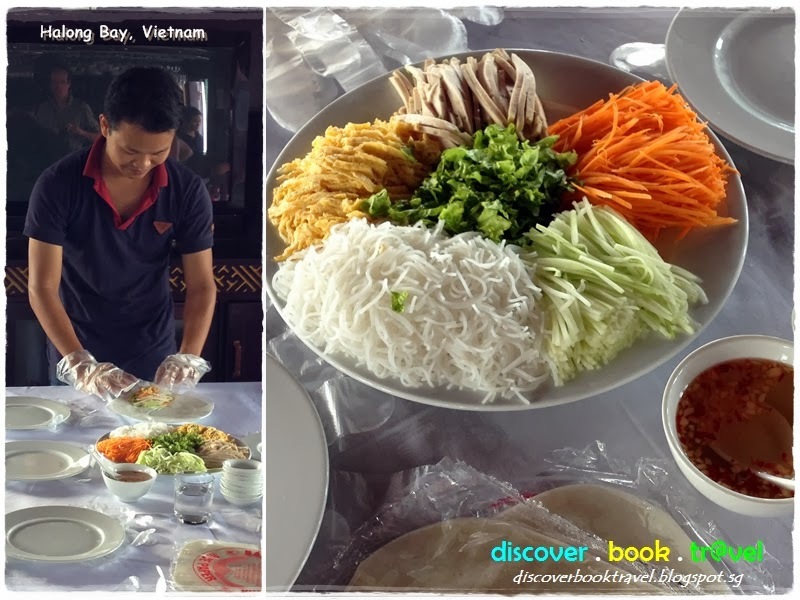 Steward on board demonstrating to us the ways of making a Vietnamese Spring Roll – one of the must-try food in Vietnam. Tommy and Samantha’s hand-made Vietnamese Spring Rolls. Quite decent looking, aren’t they? 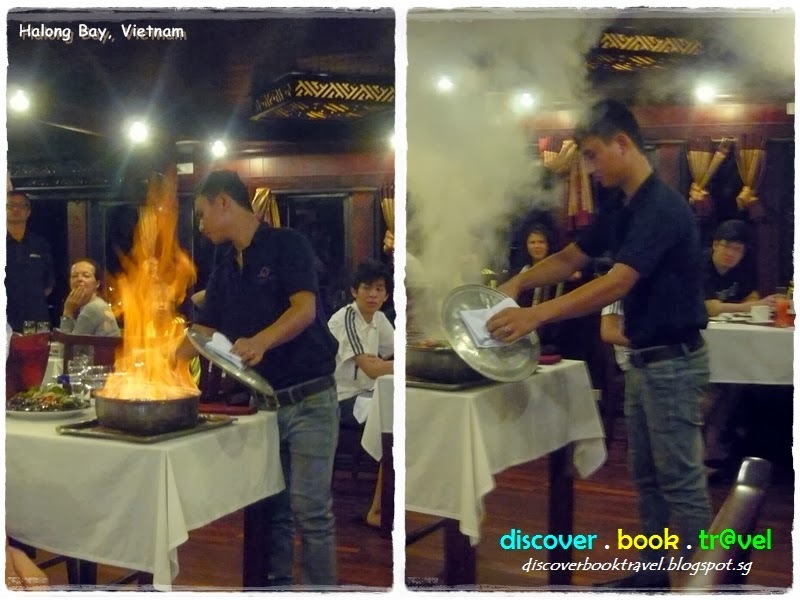 Live demonstration of cooking drunken prawns (fresh prawns soaked in Chinese wine and flash cooked to preserve their freshness). V’Spirit, as with most other cruise lines offer an outdoor and a sheltered upper deck that offers unobstructed 360 degrees view of the spectacular scenery. Make sure to grab a good book to entertain yourself while lying on the deck chair. We had a most wonderful 3D2N on board the V’Spirit. Its family atmosphere and cozy environment makes it ideal for a short getaway for families and friends. It’s also a great way to party the night away with your loved ones with cheap beer on board. Couples looking for more privacy and a more classy setting should look for the more luxurious cruise lines. For example, some cruises have a private balcony for all cabins and exclusive seating arrangements during meal times. 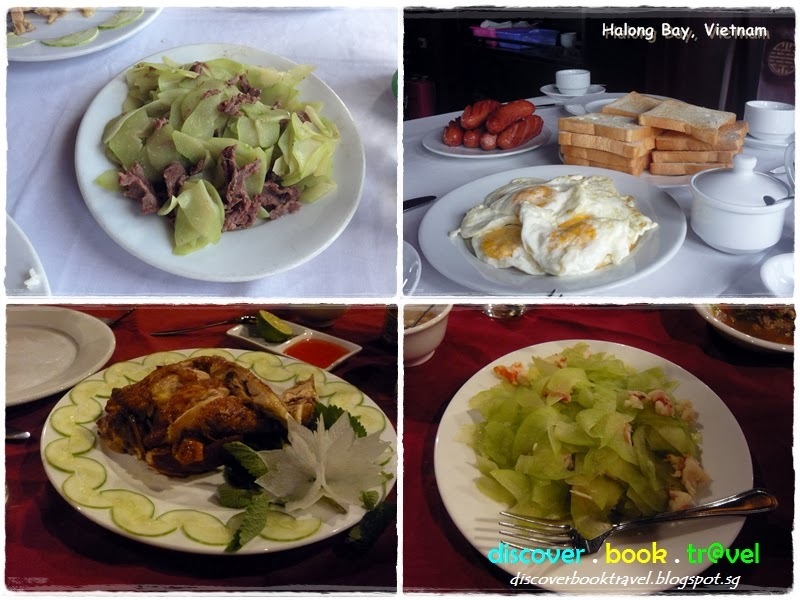 Make Halong Bay the first destination when you arrive in Hanoi. Cruises along Halong Bay are dependent on the weather and there are many cases where the scheduled cruise had to be cancelled due to inclement weather. When that happens, you’ll have the flexibility and the time to rearrange the later part of your itinerary to accommodate a later cruise. Bring lots of sunscreen, sunglasses and a poncho. The weather can change from sunny to rainy at short notice. Bring your swim wear in case there is a chance for diving or kayaking activities. If your room has a window or balcony, make sure that the curtains are drawn for privacy. The street vendors on water have a most sneaky way of appearing at your window to hawk beverages, titbits and souvenirs. 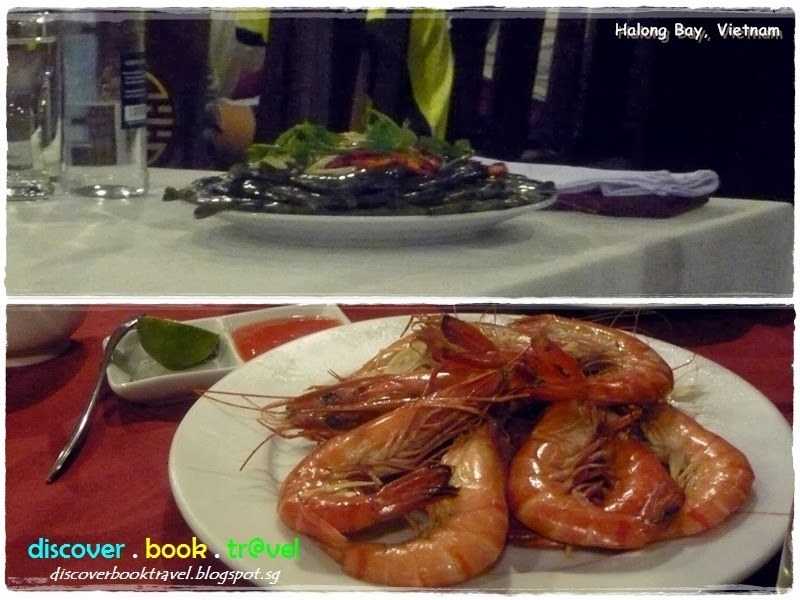 We book our Halong bay cruise as a package with the hotel we stayed. As for expenses, there wasn't much to buy.. Except for drinks on board the cruise..